Discussion in 'UFC Discussion' started by Da Boss, Dec 28, 2012. He's mad that his next loss had to be a week from it's original date. I think Melvin will win but I definetly think he took it to far and I'm pulling for Varner. It looks like someone stapled a slab of beef to Starvin Marvin's shoulder. Wonder what's going through Varner's head? Dammit Melvin, yer just setting yer self up for more embarrassment. Go Varner! He's thinking "Hmm sub in the second round"
I think Varner might put him to sleep. If Jamie does what he did to Edson, then he has nothing to worry about. Melvin's last four fights all have looked the same except for one, that's a bad streak. The last time he was hyper, Lauzon choked him out. 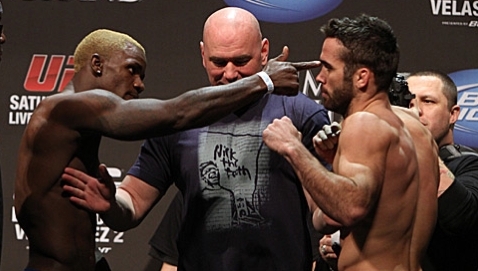 What are the odds that Varner taps Guillard out and then Guillard gets up and gets mad at Varner even though he tapped? This will go like a lot of Melvins fights. He'll come out swinging for the fences for the first 60 seconds, gas, then Varner is gonna sub him. Are you predicting another Clementi-style scrap? He needs a better chin. Did the same thing v Joe Daddy too.